So, months ago I had seen Project Life advertised on Becky Higgins’ blog and thought it was way cool and that my best friend could really use this. So, I bought it for her for Christmas. When I opened the box to look at it before wrapping (yes, I peeked!) I really got excited about it and wanted one for myself. So, I asked David for it for Christmas and I got it!!! Like most people using PL I started on January 1st. I’m a chronological scrapper anyway so this makes sense to me. I’d been feeling the need to change the way I scrapbooked and when I saw this kit I knew this would work great for me. So, now that I’ve completed almost 4 weeks now I thought that I could show you mine. Becky has a video tutorial on her blog about how to put the thing together, so I did that. I even put all the journaling cards in their places so I just had to plug pics in and pull out the respective card and write a few sentences. I also, needed to find a way to get my pictures conveniently. I’ve been using the app Project 365 on my phone for a couple of months now and it reminds me every day to take a picture. So then I send my pics to Shutterfly and they print out at Target. I go to Target every week so this works perfectly for me. I just upload the pics on a Friday (the end of my week) and get them on Monday. Right now I’m trying to focus on taking a picture a day and not on the quality of the picture. I do use my camera for some pictures but most are from my phone. So far this is working well and once I put the pics in it only takes 15min or so to write some journaling for that week. I LOVE this! This system is forcing me to focus on our day to day lives not just the big events. And instead of facts, I focus on feelings/emotions. Even David has started taking a picture a day (POD) on his phone as well. If you aren’t familiar with this product go check out Becky Higgins blog. You can order Project Life on Amazon by clicking it on the right side of the blog. This is what my desk looks like right now. I have 4 open projects on it! I have some canvases I was trying to paint for the hall bathroom, I'm trying to sew a dress, there's a picture frame that needs to be painted and fixed and all those paint cans! This is all my neutral colored leftover paint from around the house. I pulled it all in, in hopes that one will work in our master bathroom. I might even try mixing some....this could be scary! I need to focus and figure out which one to do first! For the first 4 years of our marriage we worked in 2 churches. Those were huge learning experiences but also very emotional, hurting experiences. While we found one of our best friends at one church, our times at them are not fond memories. As the old saying goes “Christians are the only ones who eat/kill their own” Anyway, we finally made the change of career and church. We started attending a large church where we could just blend in for a while (the other churches were very small). We spent the next 7 years healing at this big church. It was a nice place but after a while we started feeling stale. It was comfortable there. Well, except for the 30min drive which started to wear on us and we started to dread going. That’s not what we wanted. In the spring of 2010 we noticed that a “new” church was coming in just up the street from our house. Actually this church isn’t new but they have campus’s (locations) all over the state and even in other states. It’s called LifeChurch. We were very familiar with them as we had heard the pastor speak when we were dating. But we were very ready to start going there when they opened on Easter Sunday. We love it there! Everyone is so friendly, the vibe is young and fresh, and the sermons/talks/series (whatever you want to call it) are relevant to our lives. It challenges us and makes us want to be better people. We feel the need to invest back into our community, which is where our heart is. If you haven’t heard of LifeChurch or aren’t familiar with them, here’s the skinny. The senior pastor does the speaking for each experience (service). Each location has around 4 experiences a weekend. Craig (senior pastor) speaks live at one of the campus’s and then it’s taped for the other campus’s to view at the appropriate time. Yes, you watch him on a screen. I’ve heard of many people getting very hung up on that part, but honestly you don’t really notice it. Especially coming from a church that was so big that they put the pastor on screens while he was on stage so everyone could see him. Not really that different. Anyway, there is also a campus pastor that works that particular location and someone you can get to know if you want. We work together with the other campus’s for goals but also do small things as just a campus. But, the thing that seems to be making the biggest impact is that you can watch any of the talks/series online anytime you want. People across the world, yes world, are watching these. It’s amazing. Being there has changed our life for the better and I just wanted to share. If you are interested in LifeChurch you can check them out here. About a year and a half ago, I started a big bedroom redo. I found a painting I was in LOVE with and that of course started the whole “need” to redo the room. The painting just wouldn’t “go” with the current look. And I needed something more to the room. Here’s the painting. It’s by Tomasz Rut. I really like how it’s an intimate image but not vulgar, which makes it perfect for our bedroom. A few months after that we decided (for other reasons) to go from a queen size bed to a king. So, of course I had to get all new bedding… But I had liked the bedding on the queen, so I just bought it in a king. For me, I LOVE, LOVE, LOVE white bedding. White sheets and white down comforter with duvet. I also go new lamps because the old ones didn’t match (I want bed lamps to match), I painted the bottom part of the walls and I inherited an old arm chair. Oh and I got new curtains and rod. But this is where I ran out of ideas and stopped. It was nice and calm but not what I really wanted. Ok, here’s the bed side of the room. Starting on the left I have a picture of David and I on our last cruise. It was taken by our friends as we look at the sun setting over the ocean (totally awesome!). I had it blown up to 11x14 and used an old frame and mat board. I really love the picture but the wall needs something else. I’m thinking some vinyl saying might be good over the picture. I'm just not sure what saying yet. The lamps. I thought I liked these when I bought them but I don’t like them anymore, or at least in here. I found some at Lowe’s that I LOVE, but Lowe’s is still holding them for me until I can pay for them! I want them to be glass/crystal looking with white shades maybe jazzed up. The nightstands we’ve had since we got married. They were David’s grandparents furniture (as well as 2 dressers) and so he brought those to the marriage. I didn’t (and still don’t) like the style, so I’ve made the best out of it and painted them a couple of times. I really want some wood tables with at least one drawer at the top instead of the bottom. I haven’t found any yet that I could afford, so I’m still on the hunt. Can I just say, I HATE alarm clocks! I hate the look of them! They are so bulky and ugly. I’d love to replace mine at the least but I don’t have a clue to what. As you can see the bed doesn’t have a headboard. I want and intend to make an upholstered headboard. I have the fabric but I just need the rest of the supplies. That will happen over the next several months. I also intend to make some new pillow shams for the pillows in the back row. I want them in a color, probably something that matches the curtains. I want the pillows to have some depth. I have recovered the throw pillows on the bed and made one new one. You can see the pillows recovered here. I’ll show you how they look on the bed in a later post. The brown blanket is only on the bed in the winter. We’ve found that having the blanket on top of the down comforter traps the heat in better than under it. Also, it sometimes is folded at the foot of the bed. Which I like the look of, so I’m going to find some fabric that I can put on the bed in the warmer months. Something that adds some interest, but not weight. The bed skirt is brown because I have dogs that like to go under the bed (ugh!) and a toddler that spills stuff. And since I don’t like having to yank that thing off the bed to wash it, it had to not show dirt easily. I had a white one on the queen bed but it was dirty a lot. And I have to have one cause I use under the bed to store things and it makes the bed look more finished. So, that will most likely be staying. I do need a duvet cover though. I want a white one but I’d like it to have a little band of color or something on it to jazz it up a bit. I haven’t found one yet that I love but I’m still looking. The little table is a Goodwill find at $5, in great shape and perfect size for this area. The small lamp is a good size but I’m not hot on the shade, I may do something with it. And the chair. This chair is special because it was my grandma’s chair. She had it in her room forever and when we were cleaning out the house I saw the chair and loved the shape. Of course it was a goldish/pinkish/orangy colored velvet with a skirt. It was yuck! But, I’d gotten a bit of inheritance money as well and had the chair recovered. I love how it turned out. It fits in with my home and reminds me of her. I made a little pillow to go on it and I really love this little area. The footstool is from Target and the lid comes off. I originally had toys in it till that wasn’t really necessary anymore, so I put a couple of throw blankets in it. To the right of the chair is my bathroom and closet and then the T.V./dresser wall. The dresser is part of the nightstand suite and only holds David’s clothes. I want a long and lower dresser on this wall. We have the other matching one in the office at the moment and I think I’m going to repaint it and move it in here. That won’t get done till it warms up though. I think I’ll paint it white. But I could change my mind before I get there! I need to find a durable basket to hold Trey’s nighttime books (he keeps breaking them). Oh, and the vinyl LOVE on the wall, I really love. I’m going to make 2 more Love words in other languages to go on either side of what’s there. Ok, so there’s my room and my plans. Hopefully I won’t get too off track over the next few months as I try to get this room more to my liking. I do like how the room is calming and comfortable and I enjoy it. I just know it could be better! So stay with me and if you have any suggestions, I’d love to hear them! I routinely go through Trey's toys and make sure that what we're keeping is stuff he's playing with. I also, move out toys that he doesn't play with anymore and throw out trash. I keep a tub with toys he's not playing with in a tub in his closet. Either the toys are too young for him or he's not ready for them yet. Well, yesterday was one of those times. I decided that some older toys needed to be put up and he had some Christmas presents that he hadn't yet played with. Christmas and birthday he gets so much at once, that I put some away for a few months till he's either ready for the toy or it's about time for something new. As I was rotating some of the toys, I came across some kitchen toys with food. I'd put them up another time waiting till he was a bit older. So, I got them out for him (he was napping at the time). See, lately he's really been wanting to help David in the kitchen while he cooks. Trey wants to cook too. So we'd pulled together a few small items for him in the kitchen for him to "cook" with. He's loving it, and so does David. When I showed him his "new" cooking toys, he was so excited! He had wanted to help David with dinner but once he saw these he promptly took them to his table in the living room and set them all out. He hadn't learned yet how to play with them, so I showed him how to "cook" and "eat" his food. This morning as soon as he was done with his breakfast, he went to get his cooking stuff. I love that only a few bucks (most stuff was in Target's dollar section about a year ago) worth of cheap toys and that they aren't new, but they seem new to him, makes him so happy! I love that he wants to cook. We want to teach our children that food can be fun and to try many different things, and that cooking can be fun (this mama is working on that part!). We've been trying out lots of new recipes lately and he likes all of them, even the spicy ones! I think our attitude toward food definitely is absorbed by our children. If he sees that we enjoy food, that spicy things can be for children too and have an appreciation for all kinds of veggies and such; I don't think he'll be as picky as most kids are. I love watching him play with toys that really make him happy! I saw this post on Gussy Sews about finger knitting and today I was able to try it out. I think this could be very addicting! It only took about 10min to make the necklace. I used the only yarn I have right now (gonna start knitting sometime soon...) a soft turquoise. I think it might go with most of my clothes. Anyway, check out the above post, she gives a tutorial. One of the reasons I wanted a new sewing machine was to make some pillows. I'd seen some throw pillow covers and had ideas for better ones for my living room. So, I've been working on some the past couple of weeks. Now, I'm not a pattern kind of girl. Well, I should say, I like pattern but I end up gravitating to solids as a "safer" option. But I was determined that I needed some patterned fabrics for my pillows. The living room needed that extra touch. I had 2 solid colored pillows already and one striped one. The striped one was staying as is (I fell in love with the colors! ), but the solid ones were getting recovered and I needed more. I bought 2 new ones at Pier 1. One was a solid velvet green (I know solid!) but the other was a pattern. (This was before I started making the covers.) It turned out that the pattern pillow is made with outdoor fabric, which I figure is more durrable for toddlers fingers. When I went looking for fabric I happen to really like some fabrics that also turned out to be outdoor fabrics. So, with my more durrable fabrics as well as making pillow covers instead of just a pillow, I feel better about having nice pillows with a toddler. And here are the backs of the covered ones. For the 2 that I didn't have pillows for I picked up the forms at Hobby Lobby. They were only a few bucks each with a coupon. The white pillow cover, I used fabric that I've had for a long time. A few years ago I had some cafe curtains with this fabric and I still liked it. The other 3 are all the outdoor fabric, the white is cotton. I had 2 old Pier 1 throw pillows on our bed and realized that they had zippers so the covers came off and I recovered those as well. And I had received at Trey's baby shower a pillow that had pink/purple butterflys on it that someone had made (we did know we were having a boy....), so I recovered it as well into something a bit more boyish. On Trey's pillow I used my Cricut to cut stencils and fabric paint to make it more his. I like how it turned out. Actually I'm really pleased with how they all turned out. Each pillow only took about 30min to make and super easy to make. And I really love the new pattern fabrics I found. Just a quick post. I downloaded this photo from Becky Higgins for free and I had this frame around my house, but it had some red flowers on it. I pulled them off (sorry no before pic) and found these pretty turquoise ones in my scrapbook stash (love using sb stuff for other projects) and glued them on. I decided that my vanity needed to hold the frame for a while. A little bit of spring for my winter! I've been busy making pillow covers for my house and I can't wait to show them off! I'll post in a few days the pics and how easy they were to make! I had a busy weekend and Sunday was my 12th wedding anniversary. 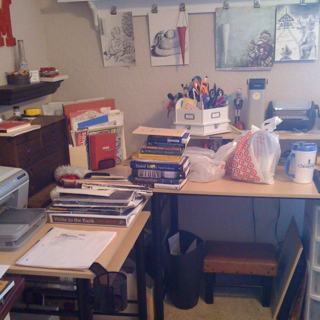 On Saturday I made plans with my parents to help them clean out/organize their office. They are new empty nesters and have gradually been fixing up the extra rooms to meet their new needs. They have an office that is really an extra living room (big) and that room had been the catch all room for a while. They had accumulated a lot of paperwork regarding their parents estates not to mention all thier stuff and an old business. But we tackled the room and eventually got through all the stuff on the floor and moved the furniture. We weren't able to get inside my mom's desk or about 8 plastic tubs with books in them....But we'll do that another time. I forgot to get a picture of the room before we started but I got one part way through. Yes, the carpet is green. They will be replacing the flooring in there in a few months, we have to get the office under control before they can start working on it. And the walls and border will be changed as well, but they won't do that till they are ready to work on the floors. We put my dad's desk/computer and office stuff on one side and my mom's desk/bill stuff on the other. There's a book shelf that kind of divides the room on another wall. When my parents bought the house about 20 years ago they had 3 girls and one more on the way. The house has 3 bedrooms and this extra living room. And my dad had a business. So they put doors on the room and were able to make it a bedroom for 2 of us. My dad (a carpenter by hobby) built wood shelves and installed them at about a foot shy of the ceiling on both sides to help with storage, that's what's on the wall under the border. I got to say I'm excited about seeing the end result but my parents move a little slow sometimes so it'll be several months. They are also wanting to remodel their master bathroom (my dad will do it all) and so I'm going to try to get pics of that as well. I love before and afters! So, yesterday David and I celebrated our 12th anniversary. We dropped Trey off at my parents and went to lunch and a movie with a little bit of shopping. We watched The Voyage of the Dawn Treader, which we really enjoyed. We are both listening to the Chronicles of Narnia books right now so we were really wanting to see this movie. ﻿ We also have a certain way we do gifts regarding our anniversary. We don't buy each other gifts to give. Since our anniversary is only 2 weeks away from Christmas we don't like doing gifts like that. We either buy something that we can both enjoy/want or we go out together and shop for what each wants. This year we didn't want anything together (within our budget!). So, I asked for 2 new pair of shoes. We had a great weekend and I hope you did too. This week I want to show off the pillow covers I made and anything else that I feel like! For several months I've been wanting to replace the mirror I have in our dinning room. It was my cousin's mirror from when she was a kid but with a new frame. She didn't want it anymore so gave it to me 3-4 years ago. The frame was a nice thick one but she liked the distressed look and I'm not much into that look so I took the mirror out and repainted the frame. The problem came when I put the mirror back into the frame. The mirror was probably around 1/4 of an inch thick. Super thin for a large mirror. But I ended up cracking a corner of it. I was bummed but didn't want to trash it because I didn't have another mirror that size and didn't want to buy one. So, there it stayed for 3-4 years always making me nervous whenever anyone got too close to it. It was hard to clean too, I was scared to press too hard on it for fear of shattering it. And then a couple months ago when we had our little earthquake (yep in Oklahaoma!) and the thing rattled really bad and I thought it was going to fall, I knew it was time to replace it. So my intention was to get a new one after Christmas. Hobby Lobby always has nice ones but even with the sales and coupons the size I needed was still a bit pricy. I ended up finding one at the perfect price and size at Ross. I so love that place for home stuff! Here's my dinning room before. I don't know if you can tell or not that the chairs have a nice plastic feel to the seat. This dinning set was my Grandmother's and she came from the era of putting plastic on stuff you wanted to stay nice. When I first got it I had intentions of recovering the seats or at least taking the plastic off. But the fabric actually went with my dinning room and then I realized that I have a toddler and that food wipes off soooo much better off of plastic. So, it's not ideal for decorating but it works for us in our life right now. I also got a wall clock for that little bit of wall on the left side of the room. I like being able to see a clock anywhere in the house and I couldn't in the dinning room and I needed something on that blank wall. Here's the new mirror and clock. I LOVE the new mirror and the clock helps the room feel warmer. I'm working on putting up a vinyl saying above the mirror. I made my first one the other day and got it up but I don't think I like it. I think it's a bit too small and the font isn't what I had in mind. So what do you think, do I redo it? I need some opinions!